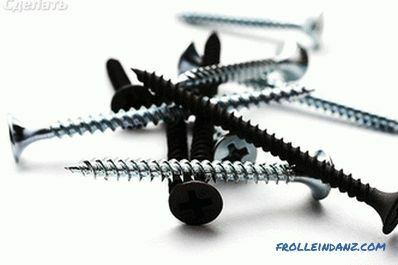 It is impossible to manage without fasteners in construction today. They allow you to connect different building materials, hang objects, reinforce certain structures and so on. One of the most common fasteners is a self-tapping screw. This product has an external thread and a head. The thread is relatively sharp, so that in some materials it can cut the internal thread itself. 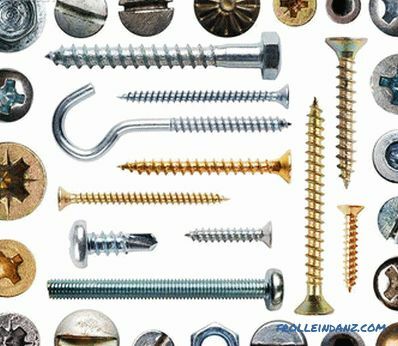 This article will discuss how to screw the screw in a variety of materials. But first, let's look at the classification of these products. Operating conditions of the connection. Is it necessary to drill a hole before tightening? In which material you need to twist it. What material will be attached. 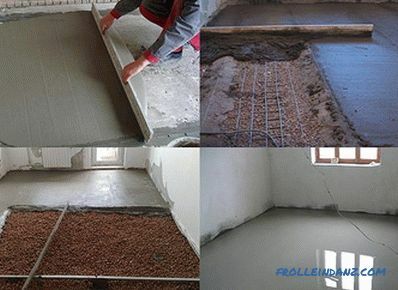 Starting from this already, you make the appropriate choice, whether it will be a screw on metal, wood or for concrete. 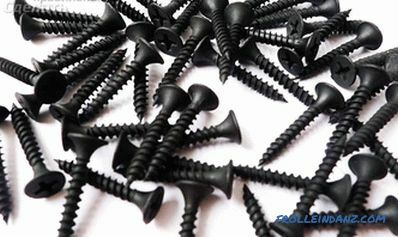 The main difference between self-tapping screws for wood is a rare thread, unlike their counterparts intended for metal. Such fasteners can be black, golden and white. So, if it is necessary to fasten a golden loop on the door, then a golden screw is selected accordingly. In most cases, the choice falls on the black screw. As already mentioned, the thread on this screw has a frequent pitch. This is due to the fact that the metal is sufficiently hard material, so the clutch must be made durable. 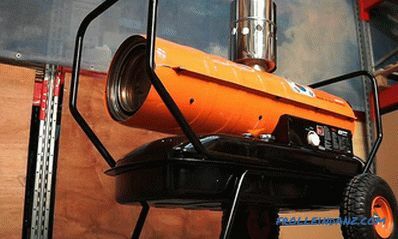 Moreover, some metals should not be drilled beforehand, for example, tin. As for the thicker metals, you will need to make a hole. 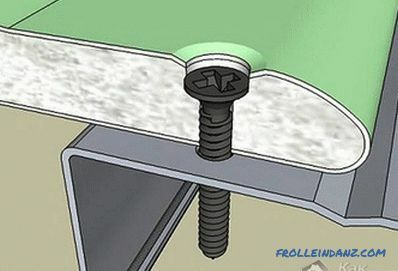 Such self-tapping screws are used to fasten the roofing sheet material. It is necessarily equipped with a sealing rubber. As a result, the connection in addition to strength, becomes hermetic. This type of screw requires pre-drilling a hole in the furniture blank. For its twisting the hex key is used. 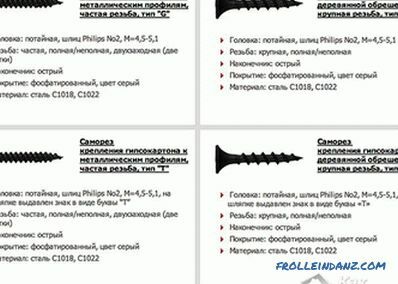 These are perhaps the most common types of self-tapping screws, which are used in different areas of construction. 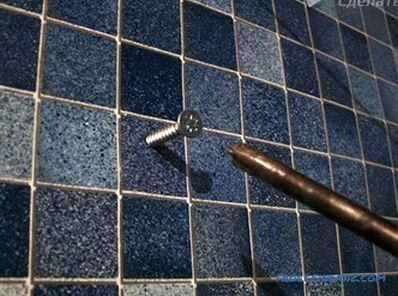 Let's look at the details of how to screw one or another screw into different surfaces. Drywall is often used to finish the ceiling and walls. And given that this material is relatively fragile, it is important to be careful when screwing a screw into it. So, to tighten the screw in the drywall will need a screwdriver with a nozzle or a Phillips screwdriver. You perform the marking on the drywall. Depending on the possible load, the step between fasteners can be from 20 to 70 cm. Next, put a screw on a screwdriver or a screwdriver attachment and set it to a point. After you start to twist it. If you use a screwdriver, then you should not include high speed. Otherwise, there is a risk to roll the screw and it will not hold anything. This also applies to the performance of the screwdriver. Do not push it. 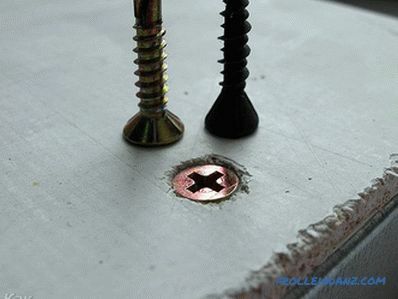 The self-tapping screw has a thread that will allow you to effortlessly twist it into drywall. It is very important to screw in the screw so as not to break through the top layer of cardboard. For example, if you fasten a giprock to a profile, then a screw with great effort can simply fall into cardboard. So, the screw head should lightly press the top layer of cardboard. But do not leave it undistorted. Otherwise, there will be difficulty in puttying. After tightening, the fastener head should be 1 mm below the general surface level. This will ensure sufficient tension. What if you failed to successfully tighten the screw and it broke through the cardboard? In this case, unscrew it back, the hole is putty, and the new screw is screwed at a distance of 50-80 mm. 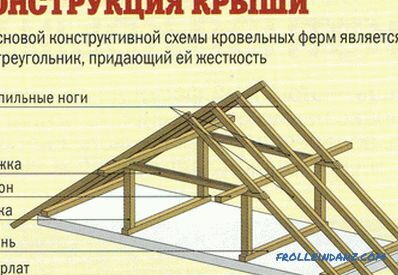 As for the type of screw, its choice depends on the material used for the batten, whether it is wood or metal. As for the length, it is enough that it entered the profile up to 10 mm. As for the twisting of the screw into the metal, here only fasteners for metal are used. The method of twisting depends on the thickness of the workpiece. If it is a thin tin, then it can often be tightened with little effort using a screwdriver or a screwdriver. 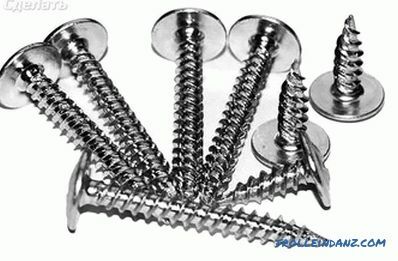 Moreover, there are different types of screws. Some have a small tip on the tip with sharpened teeth, as shown in the picture. 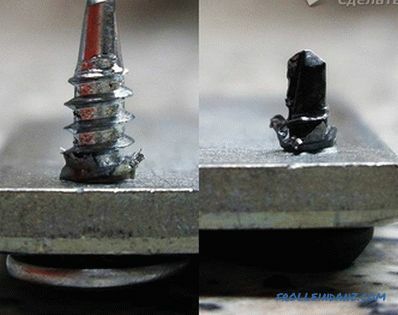 But as practice shows, not all such screws can be tightened in metal, this is due to a weak sharpening of the drill. So, for their twisting uses a screwdriver. Do not gain high momentum, otherwise the screw can overheat and dull quickly. 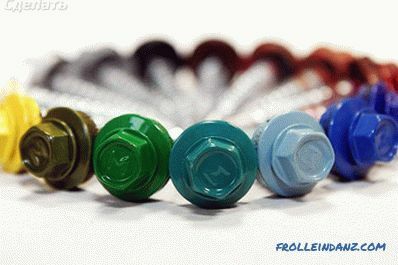 Such fasteners can be used for metal thickness up to 7 mm. If the metal is too thick, then the best option would be to pre-drill the hole with a drill / drill, and then tighten the fastener into it. This method is not associated with any problems. 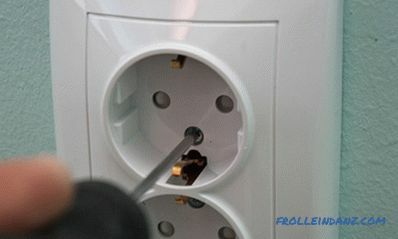 When making the hole, remember that it should be smaller in diameter than the screw. When the hole is ready, it can be lubricated with engine oil. This will allow to tighten the screw without much difficulty. 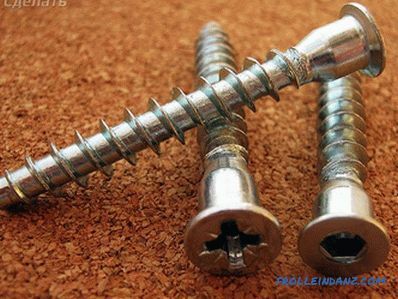 The metal screw used should be made of hard steel, which is harder than the product. As for the tree, everything is very simple. The only restrictions may apply to the wood species used. If it is soft, then you do not need to pre-drill a hole. If the workpiece is made of chipboard or fiberboard, then the hole is better to drill. 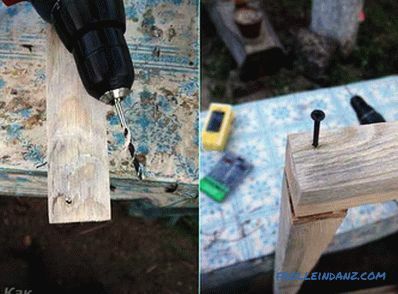 Moreover, it is recommended to drill the hole in those cases if it is necessary to twist a long screw on the wood. This even applies to soft wood. 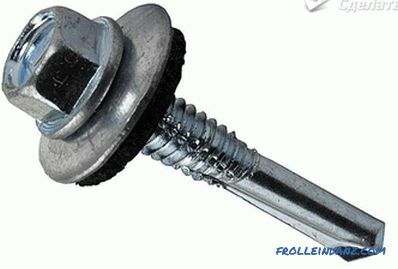 When making a hole, its diameter must be smaller than that of the screw. This will ensure reliable fastening of the blanks. In addition, the hole should also be made in cases where the wooden blank is relatively thin and there is a risk of splitting it. When twisting the screw into such parts you need to be careful. When screwing in, the cap should sink into the wood. 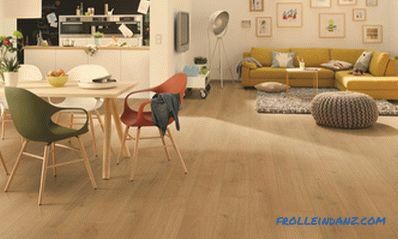 If this is a finished floor, then all the holes must be covered with wood putty. In the wall, drill a hole of the required depth. The diameter of the hole must match the diameter of the plastic tube. Next, remove the dust from the hole. After you insert a plastic cork into it. Finally, using a screwdriver or a screwdriver, tighten the screw. If the walls are plastered, then you can attempt to tighten the screw without making a hole. You will definitely succeed in doing this if the plaster is not too hard, especially if it is made on the basis of clay. This will require a screw on the tree with a rare step turns. So, we have examined with you the technology of how to properly screw the screw into different materials. If you know about other methods, be sure to write us about it in the comments to this article.